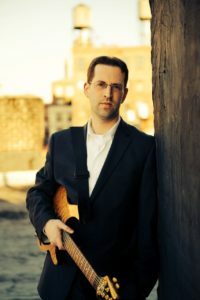 Dave Kain studied at Suny Purchase, Berklee College of Music, and eventually received a bachelors degree in jazz improvisation from Five Towns College of Music. Dave has been fortunate to study with Joe Carbone, Joe Monk, Bill Farrish, Jack Wilkins, Jay Azzolina, and Chris Morrison. In 2005, Dave recorded Citizen Kain, his first full-length album. Dave released No Pain No Kain (2007) which includes musicians Matt Garrison, upright bass player Dylan Johnson, and notable artists Jon Cowherd, and Jeff Hirshfield. In 2011, Dave released “Kain is Able” reaching a very high point in his compositional and musical development. It featured a larger ensemble than his previous efforts. The personnel are Matt Garrison, Ryan Berg, Paul Francis, Sean Nowell, Travis Sullivan and Jason Colby. 2014 bought his latest recording featuring a trio format entitled “Raising Kain”. “Raising Kain” received great radio airplay and many positive reviews after it’s release. The Dave Kain Group has played in venues all over the tri-state area, as well as Philadelphia, Virginia, Nashville, North and South Carolina, Ohio, Boston, Georgia, and Hawaii. Dave has also had the privilege to perform/record with some great musicians like Jon Cowherd, Ratzo Harris, Joel Frahm, Roy Assaf, Andy LaVerne, Harvie S, Jeff Hirschfield, Jerry Z, Sean Nowell, Travis Sullivan and Noah Preminger. Dave is also very active as a teacher. He teaches regularly around the lower New York area and has performed clinics/performances at Clemson University, Dennison University, Hobart and William Smith Colleges.